In A New Hope, Admiral Motti says that the Death Star plans were stored on data-tapes. I always figured this was something that would just be conveniently ignored in future installments, but Rogue One doubles down on this by making it clear that the Scarif facility is storing the Death Star plans on a data-tape. Given that holograms, droids, datapads, and other advanced electronics exist, why does the galaxy far, far away use such as primitive technology as data-tapes at all, especially for something as important as the Death Star plans (which can be transferred to whatever un-tapelike thing the rebels hand off to Leia)? * Just realized that Motti’s really rubbing salt on the wound since the stolen data-tapes were almost certainly destroyed by the Death Star’s destruction of Scarif and Vader surely knows that. Because it's the backup and backups are better on tape. The fewer moving parts an object has, the more robust it is. Additionally, the long term degradation of electronic memory cells is a problem. So when you make a back up of something, you want it to be able to survive a long time. Tape can do this. Technology in Star Wars has advanced enough to create a 512-million exanode capacity monomolecular-switching binary tape the size of a book. In English, that means they are using nanotechnology to encode data into the tape at the molecular level. Remember, this is the backup, it's not the version that will be actively accessed, it doesn't need to be quick like flash memory is (that said, it is still pretty fast in real life). And finally, it is much (much) cheaper. In real life, hard disk drives (HDDs) cost about 50% more per GB than tape, and solid state drives (SSDs), which are far more robust than HDDs, are a whopping 850% more expensive per GB than tape. For a real world example, Google made headlines in 2011 when it was discovered that they kept long term backups on tape. So it's not a bad method of data storage at all. In short, tape is the superior backup method because it is cheaper, has high capacity, greater reliability, and better longevity. The out-of-universe answer is that the original films were written in the 70's, and SF&F usually has some basis in truth. The idea of flash drive equivalents probably didn't even occur to Lucas while he was writing it. It was carried on in Rogue One to enforce continuity. Tape backups have the advantages of being lighter weight and less fragile than a removable hard disk, far less expensive than Flash RAM storage (at least until the last couple years), and easily portable. Not to mention that if a high capacity tape storage format was standardized in the early days of space travel, with millions of petabytes stored that way, it might be easier to continue with that standard technology (and incremental, backward compatible capacity upgrades, like the 250 MB version of QIC-80) than to arrange to transfer every book, photograph, spreadsheet, etc. in the galaxy to a new storage format before the last "Old Republic Standard Tape System" reader became non-functional (think how hard it is to find a working 8-track player, or 9-track reel-to-reel data drive these days). What makes you believe data tapes are primitive? There are many form factors we can store data on. Each form factor is built around the assumptions of how it will be used. Data tapes don't fit the way we use data today, but that doesn't make them primitive. So it's not that tape is primitive, it's that its use has fallen out of style because it does not match the way we want to use data in most of our life. Perhaps, in the future, we will change our mind, and data tapes will be a real thing again. I once read somewhere that George Lucas wanted to keep some connection to reality when the movies were made. It's the same reason why the headphones on the Millenium Falcon have cables attached to them because wireless signals were considered too futuristic by Lucas. Its also a lot easier to have fluent dialogs in a movie without having to explain every detail of the universe. As for a source, I could have sworn it was on this site but I'm having trouble finding the question. For surface area the square footage of a tape represents the most efficient format. No other format can store a flat surface area in such a compact volume. A tape doesn't have to be magnetic. An advanced society could still use advanced data storage formats, but if you are limited to storing that data on a surface. Well a tape is the best approach. All old science fiction books contain what was the latest and greatest at that time. For example, in books of Stanislaw Lem, data was stored on microfilms. Who would today even think of microfilms? Maybe only when watching old James Bond movies. Star wars was created during seventies, and then tapes were high tech. If they waited 10-20 years to create star wars movies, I am sure it would be hard disk, CDs or some kind of data cubes. The fact that data is today backed up on tapes means nothig. Technology is advancing quite fast, and nobody knows what will replace tapes (that thing probably doesn't even have a name). Tapes are still being used. Okay, they may not be in use for day-to-day backups any more in your typical office, but if you have a seriously high volume of data that needs to be archived, tape is still the answer: they are still being used and they are still being developed. 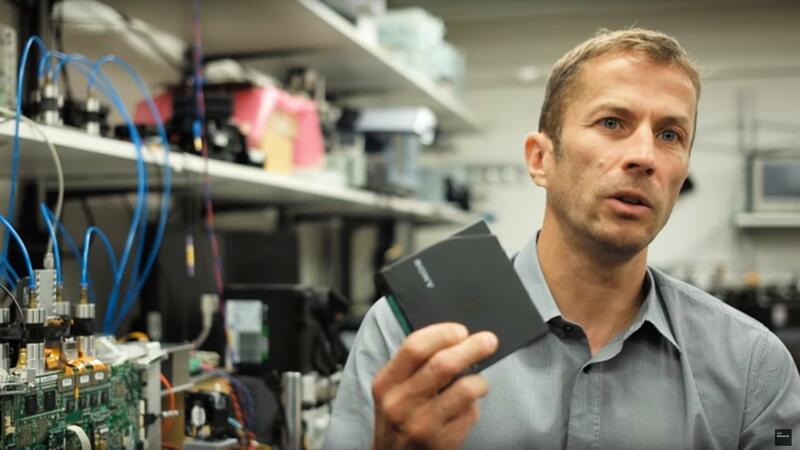 See this story from just a couple of months ago where Sony and IBM have made a tape system that stores 330TB on a single cartridge, and expect capacity to continue to double every year for at least another decade. That might even give you enough storage to hold the plans to the Death Star. The data "tape"s in Star Wars might be actual data tapes like those of the present, but far more advanced, as others have suggested. Or "tapes" might be a word that has changed its meaning over time, as I suggested in an answer in a thread asking about data "tapes in Star Trek. I point out the history that explains why the control room of the Enterprise is called the "bridge" as an example of continuing to use a once accurate word to mean something different from the original meaning. Thus Star Trek and Star Wars "tapes" might not be tapes but just called tapes because tapes were originally what was used used for data storage. In addition the word "tapes" in Star Wars is translated from an alien language into English. If you look in this video, the same data was crammed into a thin card type device which was given to Leia. So, Star Wars universe has lots of advanced technologies and different technologies are used in different situations. First, portable storage shouldn't be that of a much requirement as data transmission speed is high. But for different scenarios, there are different types of portable storage technologies. Second, the data tapes you saw on Scariff was way more advanced than the one you see on Earth. According to Star Wars: Rogue One: The Ultimate Visual Guide, it was Monomolecular-switching binary tape which had 512 million exanode capacity. Is there an explanation for the use of tapes in Star Trek? Why don't they use gunpowder in the Star Wars universe? Does the galactic civilisation in Star Wars have a policy towards primitive races?